Todays Chefs are using dried fruits to energize their menus! A little goes a long way towards adding flavor to many menu items! Salads, Desserts, Stuffing, Sauces, Baked Goods and more! These are one of the best snack foods! Exceptional taste and flavor! We have traveled the world to find these dried fruits! From the rolling hills of the California to Northern Italy, generations of experienced farmers produce the best sun dried fruits available! Call for other dried fruits. These fruits are packed in our HACCP & Kosher certified food manufacturing plant. 5 Lbs. of Pure Great Snacking! Apples are the fruit of a deciduous tree that is botanically close to the rose. Dried Apples have the advantage of plenty of apple flavor without any of the problems associated with storing seasonal fruit for long periods of time. Our Apples are peeled, dried and cored. Contains sulfites. Theyre wonderful in granola and muffins. Mix with autumn dishes such as squash soup and deep green salads with hot and sour dressing. Chop them and add to bread or wild rice stuffings seasoned with sage. Pure Apples with a touch of sulfur dioxide as a preservative. Chefs Note: A great hiking snack. There is no preparation needed for dried fruit. If used in baking, you may want to rehydrate. To rehydrate dried fruit, pour boiling water over the fruit and let sit covered for 5 to 10 minutes. Turkish Apricots (Prunus Armeniaca) date back thousands of years and are believed to have originated in China. In Hellenistic mythology Apricots are called the golden apples of Hesperides. Apricots are a beautiful bright orange in color with a delicate, sweet flavor. Fresh Apricots have a very short growing season and are very fragile. The dried fruit offers all of the taste of its fresh counterpart without the limited seasonality. Contains sulfites. Turkish Apricots are natural and sun dried. Theyre wonderful diced and added to muffins or scones. The flavor of Apricots blends well with citrus. Try them added to your next couscous dish or in a cold chicken and lettuce salad. Apricots, Sulfur Dioxide (To Maintain Color), and Potassium Sorbate (As a Preservative). Apricots are a natural product and may contain the occasional pit. Certified Kosher Parve by KOF-K.
Click Here for Chef Designed Chef Knife Sets! Tart Cherries date back to 300 BC. They are named for the ancient town of Cerasus in Turkey. Tart Cherries are known to contain many different flavonols, which improve the flow of blood, lower blood pressure, and are good for the heart and brain. They also contain lots of powerful antioxidants which play a big part in the prevention of strokes, heart disease and even cancer. No sulfites. Bing Cherries are sweet. Rainier Cherries are hybrid cherries, a cross between the Bing and Van cultivars (a variety of a plant that originated and persisted through cultivation). They are sweet cherries with a yellowish flesh. Rainiers are considered the cream of the crop. They are a good source of vitamin C, and are high in fiber. Cherries are great in pies, jams or as sweet toppings for ice cream, waffles and pancakes. Dried fruits may be eaten right out of the bag as a convenient and healthy snack. Mixed with granola and almonds or in a trail mix. Cherries, Sugar, Sunflower Oil. Cherries are a natural product and may contain an occasional pit. Certified Kosher Parve by KOF-K. Chefs Note: An amazing hiking snack. There is no preparation needed for dried fruit. If used in baking, you may want to rehydrate. To rehydrate dried fruit, pour boiling water over the fruit and let sit covered for 5 to 10 minutes. Click Here for Chef Designed Kitchen Table Sets! Cranberries are also called bounce berries, a fresh Cranberry will bounce if dropped. Cranberries have traditionally been associated with Thanksgiving, mainly because Thanksgiving falls in the middle of Cranberry season. Dried Cranberries are available year round and add a wonderful tang to winter stuffings and summer salads. Cranberries are a great source of Vitamin C and they are reputed to help maintain healthy PH levels in the renal system. No sulfites. Certified Kosher Parve by KOF-K. Chefs Note: We like them for a snack. Add nuts, seeds or any favorite ingredient to create Trail Mixes, or, blend into muffin mixes. Perfect for snacking, baking, backpacking and cooking! These delicious berries (Vaccinia Corymbosum) grow on bushes, both cultivated and in the wild. Though the wild berries are a favorite of the black bear, it is the cultivated berries that make their way into food markets. When dried they retain all of their sweetness, but become more versatile Blueberries have a reputation for increasing night vision, and, therefore, were eaten by British pilots during World War I. Think of blueberries as an alternative to raisins. No sulfites. Certified Kosher Parve by KOF-K. 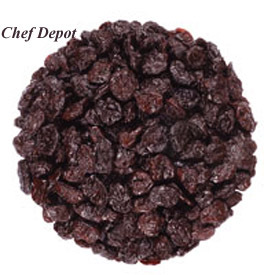 Chefs Note: These are the best dried blueberries that we have ever tasted. Live Longer with this natural and tasty antioxidant. We like them for a snack or blend into blueberry muffins. Perfect for snacking, baking, backpacking and cooking! Click Here for Chef Designed Kitchen Islands! Dried Pineapple (Ananas Comosus). Pineapple is named as such because of its resemblance to a pine cone. In most European languages besides English the Pineapple is known as Ananas which is derived from the Paraguayan name for excellent fruit. The Pineapple is native to Central and South America. Dried Pineapple, like the fresh fruit, has a sweet mildly tart taste. Pineapples are a good source for Vitamins C and A. Add nuts, seeds or any favorite ingredient to create Trail Mixes, or, blend Fruit Fusion into muffin mixes. Certified Kosher Parve by KOF-K. Chefs Note: We use it in fruit salsa to compliment Grilled Fish. Nice to have in the cabinet when fresh pineapple is not available. Great in Holiday Spice Cakes too! Many cooks prefer to use diced pineapple since it a tough fruit to cut up. Diced Dried Pineapple, 5 lbs. Click Here for the Knives that You Can Buy! Tart Cherries, Diced Apricots, Zante Currants and Diced Apples are joined together to create this fantastic Fruit Fusion. The contrast between the tartness of the Cherries and Apples, and the sweet background of the Apricots and Currants, is perfect for many applications. Add nuts, seeds or any favorite ingredient to create Trail Mixes, or, blend Fruit Fusion into muffin mixes. Certified Kosher Parve by KOF-K. Perfect for snacking, baking, backpacking and cooking! Click Here for the best Blender You Can Buy! 5 Lbs. Black Mission Figs! These are the highest quality dried Black Mission Figs we have tasted! Soft, plump and filled with natures goodness. Grown with pride in the USA. This shelf stable product comes packed in a air tight extra thick plastic bag inside a sealed box. Certified Kosher Parve by KOF-K. Perfect for snacking, baking, backpacking and cooking! Click Here for Chef Tested Commercial Toasters! These Chrome Beauties can last a lifetime! These are the highest quality dried Goji Berries (Wolfberries) that we have tasted! Soft, plump and filled with natures goodness. Goji Berries, also known as Wolfberries, are the fruit of boxthorn plants. They are 1 to 2 centimeters long. Goji Berries are considered one of the very nutritious superfruits, rich in antioxidents. They are used by practitioners of Chinese medicine. Goji berries are almost always found in dried form, rather than fresh. They are prized for their sweet, nutty flavor, and are used in snacks, beverages and medicines! Certified Kosher Parve by KOF-K. Chefs Note: Boost your immune system. We like these in Chicken Dumpling Soup. If you have a cold, these can help cure you fast. Dried cherries are know to be an antioxidant powerhouse. Ongoing studies suggest dried cherries have health benefits, helping to reduce inflammation and the pain of arthritis and other benefits. Dried cherries contain antioxidants which has been linked to a variety of health benefits, including protecting against heart disease and cancers. Ours are the best we have tasted. Click Here for more Dried Fruit! Dried blueberries are a good source of fiber which contributes to a healthy heart, lowering cholesterol, and helping with digestion. 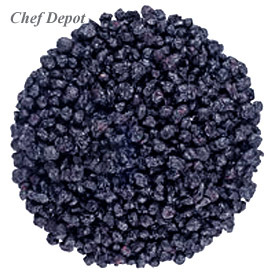 Dried blueberries contain antioxidants. These antioxidants help neutralize free radicals, unstable molecules linked to the development of diseases and certain cancers, cardiovascular disease and Alzheimers. Ours are the best we have tasted. Click Here for Chef Selected Knife Sets! 5 lbs. of Wonderful Red Raspberries! These are the highest quality dried Red Raspberries that we have tasted! Soft, plump and filled with natures goodness. Believed by many to be the most exceptionally flavored berry in its family, the red raspberry makes a great jam. Red raspberries are made up of connecting drupelets, or individual sections of fruit, each containing their own seed, that surround a central core. Red raspberries contain a substantial amount of iron as well as potassium and Vitamins A & C. Dried red raspberries have a longer shelf life than fresh berries. This shelf stable product comes packed in a air tight extra thick plastic bag inside a sealed box. Certified Kosher Parve by KOF-K. Chefs Note: Moist and chewy, quite simply a perfect healthy snack food. Great in Rsspberry Vinaigrette Salad Dressing! Perfect for snacking, baking, backpacking and cooking! We also put these on ice cream and in muffins. These are the highest quality dried Calimyrna Figs we have tasted! Soft, plump and filled with natures goodness. Grown with pride in Greece. This shelf stable product comes packed in a air tight extra thick plastic bag inside a sealed box. Certified Kosher Parve by KOF-K. Perfect for snacking, baking, backpacking and cooking! Click Here for Bar Height Work Tables! We love these Golden Figs! These are the highest quality dried Golden Figs we have tasted! Soft, plump, moist, and filled with natures goodness. These are grown in USA. This shelf stable product comes packed in a air tight extra thick plastic bag inside a sealed box. Certified Kosher Parve by KOF-K. Perfect for snacking, baking, backpacking and cooking. These are the highest quality dried Calimyrna Figs we have tasted! Soft, plump and filled with natures goodness. Grown with pride in Greece. This shelf stable product comes packed in a air tight extra thick plastic bag inside a sealed box. Certified Kosher Parve by KOF-K. Perfect for snacking, baking, backpacking and cooking. 5 lbs. of Wonderful Dried Mango! These are the highest quality dried Mango that we have tasted! Soft, plump and filled with natures goodness. Imported. This shelf stable product comes packed in a air tight extra thick plastic bag inside a sealed box. Certified Kosher Parve by KOF-K. Chefs Note: Moist and chewy, quite simply a perfect healthy snack food. Perfect for snacking, baking, backpacking and cooking! We also chop it up and put it in muffins. 5 lbs. of Wonderful dried Nectarines! These are the highest quality dried Nectarines that we have tasted! Soft, plump and filled with natures goodness. Imported. This shelf stable product comes packed in a air tight extra thick plastic bag inside a sealed box. Nectarines have sulfur dioxide as a preservative. Nectarines are a natural product and may contain an occasional pit piece. Pictured is whole fruit before drying (actual slices are about 1/2 in thick). Certified Kosher Parve by KOF-K.
5 lbs. of Wonderful dried Jackfruit! These are the highest quality Jackfruit that we have tasted! Soft, plump and filled with natures goodness. Imported. This shelf stable product comes packed in a air tight extra thick plastic bag inside a sealed box. Part of the Mulberry Family, the jackfruit is the largest tree borne fruit in the world. Fruits can grow t be 90 cm long and 50 cm in diameter. They can weight up to 36 kg. They taste similar to pineapples, but are milder and less juicy. Certified Kosher Parve by KOF-K. Chefs Note: We really like this as an afternoon snack. Perfect for hiking, baking, backpacking and cooking! Great it in coffee cakes. These are the highest quality dried strawberries that we have tasted! Soft, plump and filled with natures goodness. This shelf stable product comes packed in a air tight extra thick plastic bag inside a sealed box. Strawberries (Fragaria Virginiana) are not botanically classified as a berry. However, this fact in no way deters millions of people from enjoying this delicious summer fruit. Strawberries are the most popular (non)berry in the United States. The origin of the name strawberry is unclear, but it is well known that strawberries have been a symbol of perfection and purity since the Middle Ages. Certified Kosher Parve by KOF-K. Chefs Note: You will be delighted at the first taste. Unbelievable quality. We really like to nibble on these and chocolate coat them for the holidays. Perfect for hiking, baking, backpacking and baking too! 5 lbs. of Wonderful dried Mulberries! These are the highest quality dried Mulberries that we have tasted! Very similar looking to a blackberry in size and shape, Mulberries. They have a weak sweet-sour taste when ripe. When dried to this stage, they are chewy and have a fruit - candy like taste! Muleberries are widely used in pies, tarts, wines and cordials. We like them just for snacking. Certified Kosher Parve by KOF-K.
Click Here for Stainless Steel Kitchen Bar & Swivel Stools! Wonderful Dried Chopped Dates are a tasty & healthy treat! These chopped dates are about 1/4 inch in size. Dates are one of the oldest fruits grown by man. A delicacy enjoyed by Monarchs and Royal Families offering mythical powers of vitality and strength. Dates have long been a common food item in the Middle East, where they originated as a cultivated crop over 5000 years ago. Today Dates are also grown in the U.S.; they were introduced to California by Spanish missionaries in the 1700's. Dates contain no cholesterol and they are a good source of fiber. Certified Kosher Parve by KOF-K. Suggested Uses: A perfect after dinner snack. Backpacking and camping treat. Dates are great in desserts, add to muffins, cookies or scones. Dip Dates in chocolate and roll in coconut for an easy, elegant treat. Packed in a 10 oz. reusable container. Call for large quantity low prices. These are the highest quality dried Papaya that we have tasted! This product is slightly sweetend with fruit juices, soft, plump and filled with natures goodness. Imported. This shelf stable product comes packed in a air tight extra thick plastic bag inside a sealed box. Certified Kosher Parve by KOF-K. Chefs Note: Choose from Sweetened (for snacking) or Unsweetened! Perfect for snacking, baking, backpacking and cooking! Dried Papaya, Sweetened, 5 Lbs. Click Here for new Cutlery!